OS grid reference SO 1923 4172. St Maelog’s Cross can be found inside the parish church of St Maelog in the village of Llowes just off the A438, some 2 miles west of Hay on Wye, Powys. The cross-slab was probably carved in the early Christian period, although the stone itself is said to be of a prehistoric date. It originally stood at Croes Faelog in the Begwn hills to the north-west of Llowes, but in the 12th century it was erected in the churchyard; then in 1956 the monument was placed, for safety reasons, inside the church. The village takes it’s name from a St Llywes who may have had a hermitage here, but when St Maelog arrived from ‘the north’ he allowed him to settle in this place (Llowes) and build a small monastery or a church? More likely his monastery originally stood at Croes Faelog. in high relief from the surface. It is a fairly simple style of cross made up of small and large diamond-shapes inside squares with strong borders running from top to bottom, forming a wheel-type cross at the top. However, the carved cross on the opposite side was added in the 11th century and is quite crude, compared to the front side, and not that special. 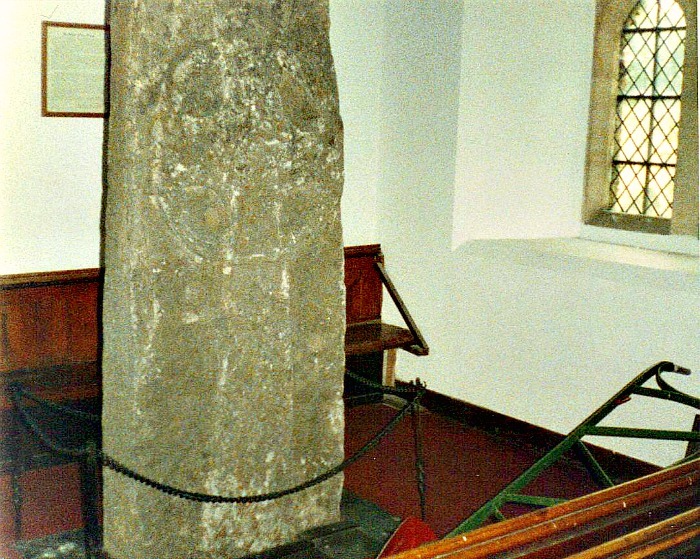 The slab is thought to be a prehistoric standing stone; the cross being carved onto it to Christianise the pagan stone by Celtic missionaries who came to the area in the so called Dark-Ages after the Roman withdrawal from Wales sometime between the 5th and 7th centuries AD. The church was largerly rebuilt in the mid 19th century and the only antiquity from the earlier, medieval church is the font which may be 12th century? St Maelog, Meulog or Meilig was a native of Clydeside in Scotland who became a soldier in the 6th century but decided to abandon that life, for a Christian one. He was of the family of Caw Cawlwyd, a chieftain of noble descent. His brothers were said to be St Caffo and St Gildas the Historian. It seems he first settled on the Isle of Anglesey (c 510) where he became a follower of St Cybi; there is a church dedication for him at Llanfaelog, Anglesey. Later, after an education under St Cadoc at the monastic college of Llancarvan, south Glamorgan, he became a Christian missionary at Llowes (c 540) and evangelized around the area as far as the Begwns. Maelog is also known to have visited Ireland where he goes under the name St Malloc, and to have died in Brittany about c 590 AD. A well-known local and rather fanciful legend says that a 12th century giantess called Moll or Malwalbee (Maude de St Valerie) of Hay Castle got the stone, or pebble in her case, caught in her apron while at at Glasbury and, because it started to annoy her she decided to throw it across the River Wye from her castle at Hay to where Llowes church now stands; the pebble was, in fact, St Maelog’s Cross! In the book ‘The Story of Brecknock’ by Wendy Hughes we are told that: “she re-built Hay Castle in a night carrying stones in her apron”. Maude was actually the wife of William de Braose, Lord of Hay Castle. The slab has come to be referred to in legend as ‘Malwalbee’s Stone’. There is said to be a stone effigy of Moll in St Mary’s church, Hay on Wye. Maude’s husband, William de Braose, also held Abergavenny Castle 18 miles to the south. By all accounts he was not a nice person and was known as “the Ogre of Abergavenny” according to Wendy Hughe’s book. William de Braose murdered the Welsh chieftain, Sitsylt ap Dyfnwal of Castell Arnallt, near Clytha on Christmas Day in 1176 during a banquet held at the lord’s castle in Abergavenny. The relatives of Sitsylt later destroyed Abergavenny Castle (c 1182) while de Braose was away but they were unable to find the murderer. His noteriety caught up with him eventually, and de Braose died a pennyless beggar in France, 1211. Hughes, Wendy., The Story of Brecknock, Garreg Gwalch, Llanrwst, Gwynedd, Wales, 1995. Barber, Chris., More Mysterious Wales, Paladin (Grafton Books), London, 1987. Spencer, Ray., A Guide to the Saints Of Wales and the West Country, Llanerch Enterprises, Felinfach, Lampeter, Wales, 1991. Palmer, Roy., The Folklore of (old) Monmouthshire, Logaston Press, Little Logaston Woonton Almeley, Herefordshire, 1998. Categories: Ancient Crosses, St Maelog's Cross at Llowes in Powys | Tags: Ancient Crosses, St Maelog's Cross at Llowes in Powys | Permalink.